Foundation Repair in Missouri | Pro Foundation Technology Inc. In Missouri, most foundations fail because of water-related issues. 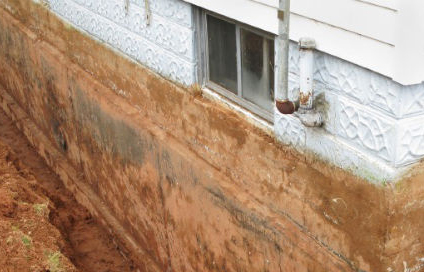 Too much water, caused by heavy rainfall, creates pressure against the foundation walls. As a result, the foundation may crack or even move. Water seeps through the cracks, causing basement flooding and other water-related disasters. Drought-like conditions also have the same effect on foundations, causing shrinkage and voids under the surface. If you have foundation or basement problems in Missouri, contact Pro Foundation Technology, Inc immediately. We offer the latest solutions and products to keep your home or business safe and dry. Crumbling foundations, wall cracks, voids under the surface, and shifting foundations are just a few signs of foundation failure. If you suspect foundation damage, contact our experts so we can inspect your property. We use top quality ECP products, such as helical piers, steel piers, and helical tiebacks to stabilize weak foundations. Wet basements and damp crawlspaces not only produce unhealthy air, they cause wood rot and buckling floors. We install waterproofing systems to divert water away from the foundation. Waterproofing also reduces energy bills, prevents mold growth, and controls drainage issues along the home’s perimeter. Uneven concrete is not only unsightly, it’s a sign there are voids and gaps under the surface. Our experts are trained to find the root of the problem so settlement won’t recur. We use concrete leveling methods like polyjacking to lift and level sinking concrete back to normal. Wet, damp crawlspaces are perfect habitats for mold and mildew. They also cause condensation, wood rot, and leaning walls. If you have damaged floor joist, we provide crawlspace piers to lift, close, and stabilize your sinking foundation. To seal out moisture and cracks, we can install a vapor barrier. These methods are designed to keep your crawlspace dry for many years to come. For more information about our services in Missouri, contact us today! Our representatives are prepared to assist you!